Skewered kebabs and satays are a simple and versatile choice all year round (and most of the recipes in this book can be cooked under a conventional grill) but the most effective and authentic way of enjoying kebabs is to grill the ingredients over charcoal, making them perfect for summer eating. 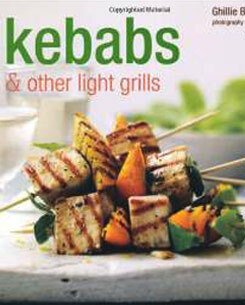 Exciting recipes for Meat include Lamb Shish Kebab with Yoghurt and Flatbread or Fiery Beef and Peanut Satay. Delicious ideas for Poultry are Harissa Chicken Kebabs with Oranges and Preserved Lemon and Duck Satay with Grilled Pineapple and Plum Sauce. Fish is great cooked this way – try Vine-wrapped Fish Kebabs with a Tangy Herb Sauce or Chargrilled Tamarind Prawns. Creative ideas for Vegetable dishes include Summer Vegetable Kebabs with Pesto and Cauliflower Fritter Satay with Coriander and Coconut Chutney. Perfect Accompaniments to serve alongside include an Aromatic Pilaf; Spicy Noodles with Ginger and Chilli and Buttery Couscous.